Copyright © New Technology Foundation. All rights reserved. 2 Copyright © 2002-2003 New Technology Foundation. All rights reserved. Welcome to a walk-through of the New Tech High Learning System™. Because so much of what we do is based on a unique combination of educational principles and technology tools, we are glad you are taking the time to learn more about how we teach and learn in New Technology High Schools. educational principles technology tools Copyright © New Technology Foundation. All rights reserved. 3 What is the Learning System? 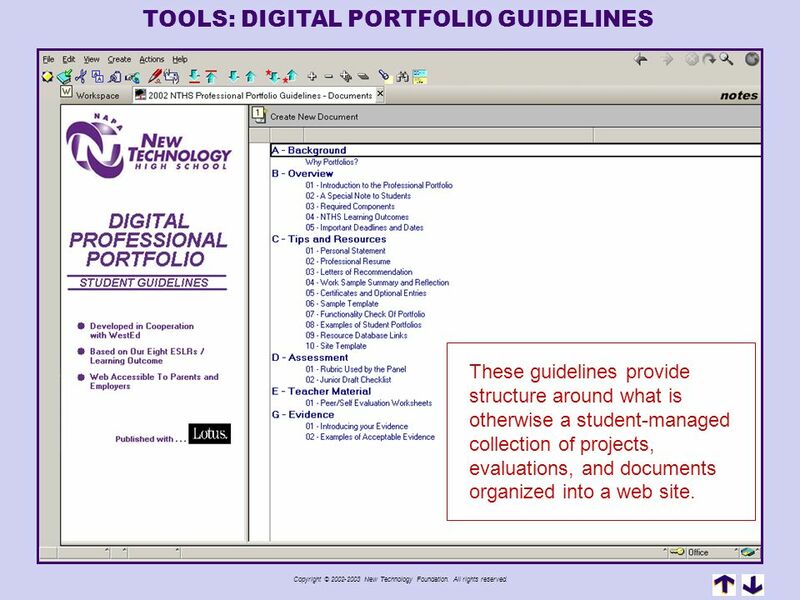 DIGITAL PORTFOLIO CURRICULUM LIBRARY NTHS GRADEBOOK What is the Learning System? 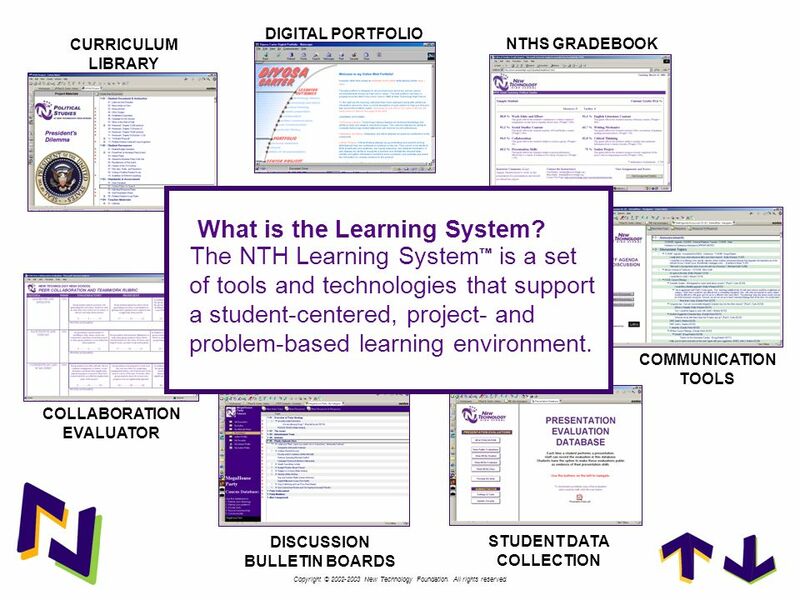 The NTH Learning System™ is a set of tools and technologies that support a student-centered, project- and problem-based learning environment. 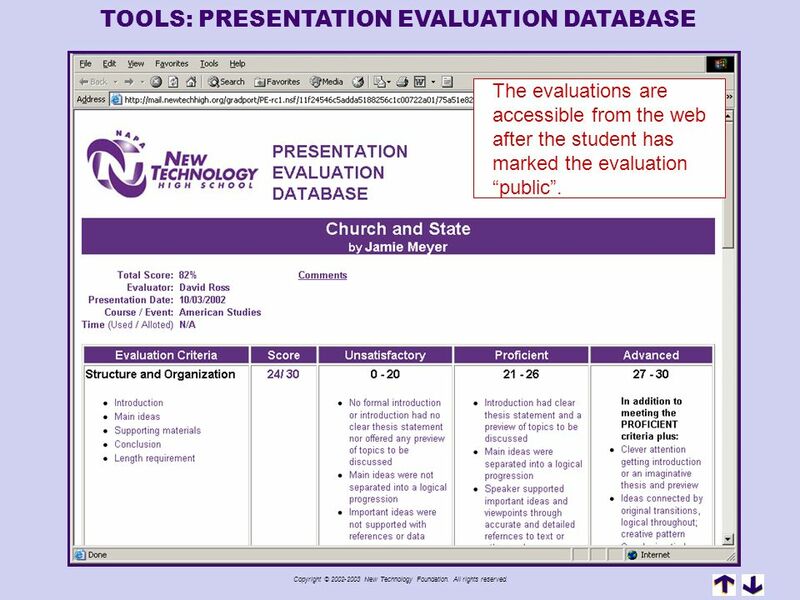 COMMUNICATION TOOLS COLLABORATION EVALUATOR DISCUSSION BULLETIN BOARDS STUDENT DATA COLLECTION Copyright © New Technology Foundation. All rights reserved. 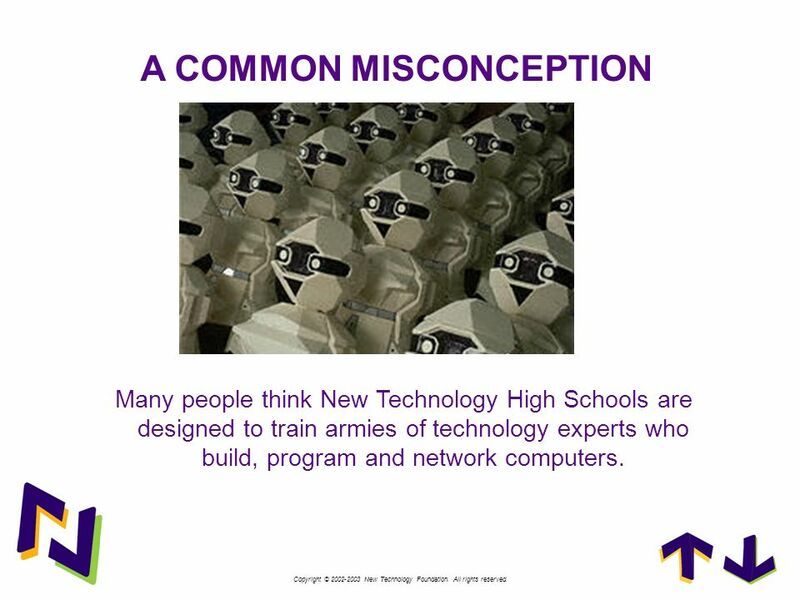 Many people think New Technology High Schools are designed to train armies of technology experts who build, program and network computers. Copyright © New Technology Foundation. All rights reserved. 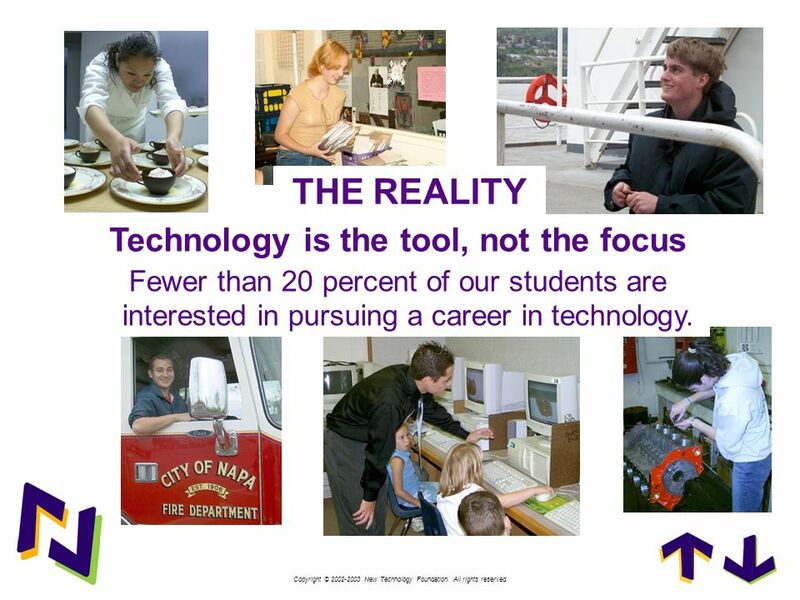 THE REALITY Technology is the tool, not the focus Fewer than 20 percent of our students are interested in pursuing a career in technology. Copyright © New Technology Foundation. All rights reserved. CONTENTS METHODOLOGY Learning Outcomes Learning Outcomes Teaching Strategies Assessment Picture symbolizing learning system …what would be our book cover TOOLS Instruction Tools Assessment Tools It’s not about the technology Communication Tools RESULTS Statistics and Research Anecdotal Data Copyright © New Technology Foundation. All rights reserved.
? What do we want students to know and be able to do when they graduate? Copyright © New Technology Foundation. All rights reserved. Methodology: Learning Outcomes Politicians like to focus on the 3 R’s… Reading Writing Arithmetic Copyright © New Technology Foundation. All rights reserved. Methodology: Learning Outcomes Most people would also want students to know about American High School Transcript World History English Literature Biology Economics Health Algebra Auto Shop U.S. History Physical Education Spanish American Literature Leadership Physics Keyboarding Year Book Agriculture Chemistry Government Geography Poetry Geometry Ceramics Business Life Science other important subjects like history, science and art. Copyright © New Technology Foundation. All rights reserved. 10 Copyright © 2002-2003 New Technology Foundation. All rights reserved. Methodology: Learning Outcomes We agree. Students should graduate with a certain body of knowledge based on content standards But is this enough? ACADEMIC CONTENT Copyright © New Technology Foundation. All rights reserved. 11 Copyright © 2002-2003 New Technology Foundation. All rights reserved. Methodology: Learning Outcomes Employers would like to see schools focus on skills useful in the workplace such as collaboration, presentation, time management, and problem solving. LIFE AND CAREER SKILLS ACADEMIC CONTENT Copyright © New Technology Foundation. All rights reserved. 12 Copyright © 2002-2003 New Technology Foundation. All rights reserved. Methodology: Learning Outcomes Again, we agree. But vocational programs and trade schools often minimize the importance of academic content. LIFE AND CAREER SKILLS ACADEMIC CONTENT Copyright © New Technology Foundation. All rights reserved. 13 Copyright © 2002-2003 New Technology Foundation. All rights reserved. Methodology: Learning Outcomes ACADEMIC CONTENT LIFE AND CAREER SKILLS The New Tech Learning System™ seeks to unify rigorous academic standards with relevant life and career skills. Copyright © New Technology Foundation. All rights reserved. Methodology: Learning Outcomes ACADEMIC CONTENT LIFE AND CAREER SKILLS PERSONALIZED LEARNING POSITIVE PEER INTERACTION ACTIVE LEARNING ENGAGED STUDENTS AUTHENTIC ASSESSMENT PRESENTATIONS AND RECOGNITIONS In addition, the Learning System employs a variety of techniques that makes learning more authentic, personal and fun. Copyright © New Technology Foundation. All rights reserved. Methodology: Learning Outcomes ACADEMIC CONTENT LIFE AND CAREER SKILLS PERSONALIZED LEARNING POSITIVE PEER INTERACTION ACTIVE LEARNING ENGAGED STUDENTS AUTHENTIC ASSESSMENT PRESENTATIONS AND RECOGNITIONS NEW TECH HIGH LEARNING SYSTEM The result is a POSITIVE LEARNING ENVIRONMENT that engages the student to become an active learner. Copyright © New Technology Foundation. All rights reserved. CONTENTS METHODOLOGY Learning Outcomes Teaching Strategies Teaching Strategies Assessment Picture symbolizing learning system …what would be our book cover TOOLS Instruction Tools Assessment Tools It’s not about the technology Communication Tools RESULTS Statistics and Research Anecdotal Data Copyright © New Technology Foundation. All rights reserved. 17 ? How are our classrooms different from traditional schools? Methodology: Teaching Strategies ? How are our classrooms different from traditional schools? Copyright © New Technology Foundation. All rights reserved. 18 Copyright © 2002-2003 New Technology Foundation. All rights reserved. Methodology: Teaching Strategies At the core of the NTH Learning System’s methodology is a student centered, project and problem based teaching strategy that is tied to both content standards and school wide learning outcomes. Copyright © New Technology Foundation. All rights reserved. 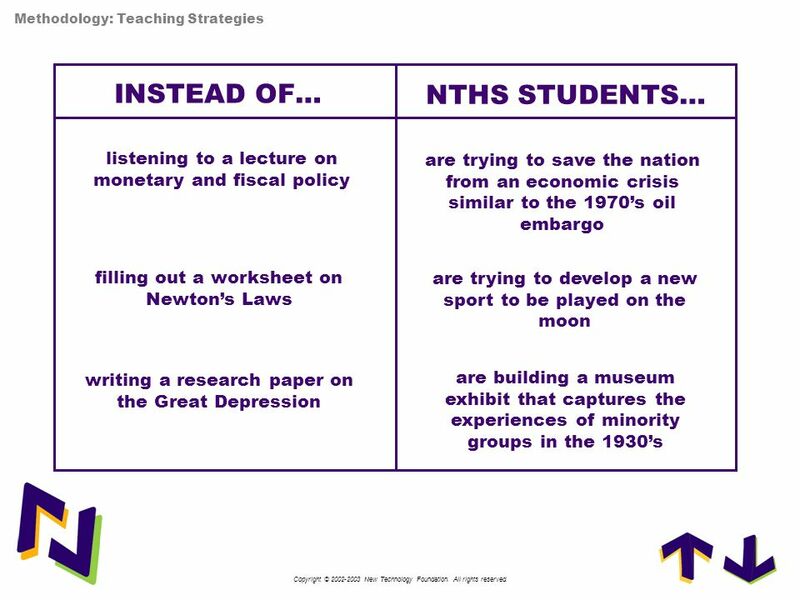 Methodology: Teaching Strategies INSTEAD OF… NTHS STUDENTS… listening to a lecture on monetary and fiscal policy are trying to save the nation from an economic crisis similar to the 1970’s oil embargo filling out a worksheet on Newton’s Laws are trying to develop a new sport to be played on the moon writing a research paper on the Great Depression are building a museum exhibit that captures the experiences of minority groups in the 1930’s Copyright © New Technology Foundation. All rights reserved. Methodology: Teaching Strategies “Will this be on the test?” This question is so painful for teachers because it reminds us that students are not really interested in the subject, or in expanding their knowledge base, or anything but doing the absolute minimum. It also makes it clear that we have done little to motivate students to become the lifelong learners we want to create. Copyright © New Technology Foundation. All rights reserved. 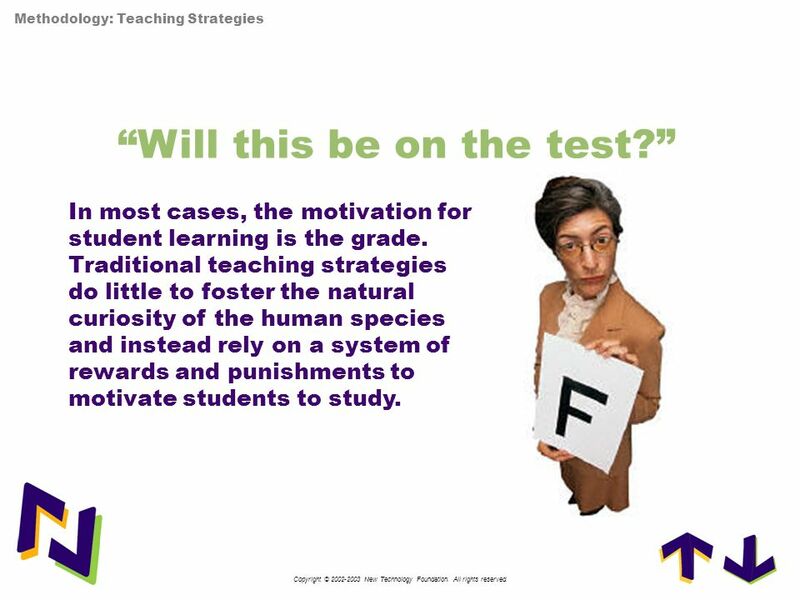 Methodology: Teaching Strategies “Will this be on the test?” In most cases, the motivation for student learning is the grade. Traditional teaching strategies do little to foster the natural curiosity of the human species and instead rely on a system of rewards and punishments to motivate students to study. Copyright © New Technology Foundation. All rights reserved. 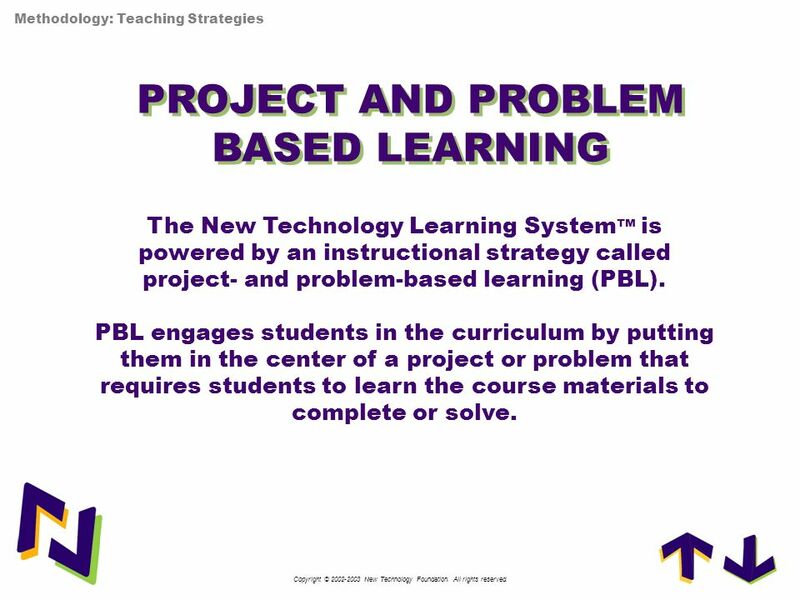 Methodology: Teaching Strategies PROJECT AND PROBLEM BASED LEARNING PROJECT AND PROBLEM BASED LEARNING The New Technology Learning System™ is powered by an instructional strategy called project- and problem-based learning (PBL). 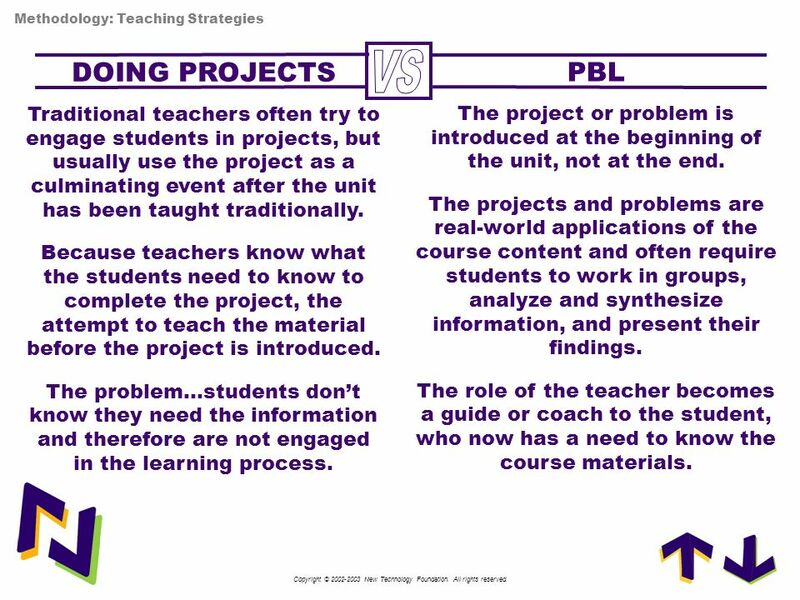 PBL engages students in the curriculum by putting them in the center of a project or problem that requires students to learn the course materials to complete or solve. Copyright © New Technology Foundation. All rights reserved. 23 Copyright © 2002-2003 New Technology Foundation. All rights reserved. Methodology: Teaching Strategies DOING PROJECTS Traditional teachers often try to engage students in projects, but usually use the project as a culminating event after the unit has been taught traditionally. Because teachers know what the students need to know to complete the project, the attempt to teach the material before the project is introduced. The problem: Students don’t know they need the information and therefore are not engaged in the learning process. VS PBL Copyright © New Technology Foundation. All rights reserved. 24 Copyright © 2002-2003 New Technology Foundation. All rights reserved. Methodology: Teaching Strategies DOING PROJECTS Traditional teachers often try to engage students in projects, but usually use the project as a culminating event after the unit has been taught traditionally. Because teachers know what the students need to know to complete the project, the attempt to teach the material before the project is introduced. The problem…students don’t know they need the information and therefore are not engaged in the learning process. VS PBL The project or problem is introduced at the beginning of the unit, not at the end. The projects and problems are real-world applications of the course content and often require students to work in groups, analyze and synthesize information, and present their findings. The role of the teacher becomes a guide or coach to the student, who now has a need to know the course materials. Copyright © New Technology Foundation. All rights reserved. 25 Copyright © 2002-2003 New Technology Foundation. All rights reserved. 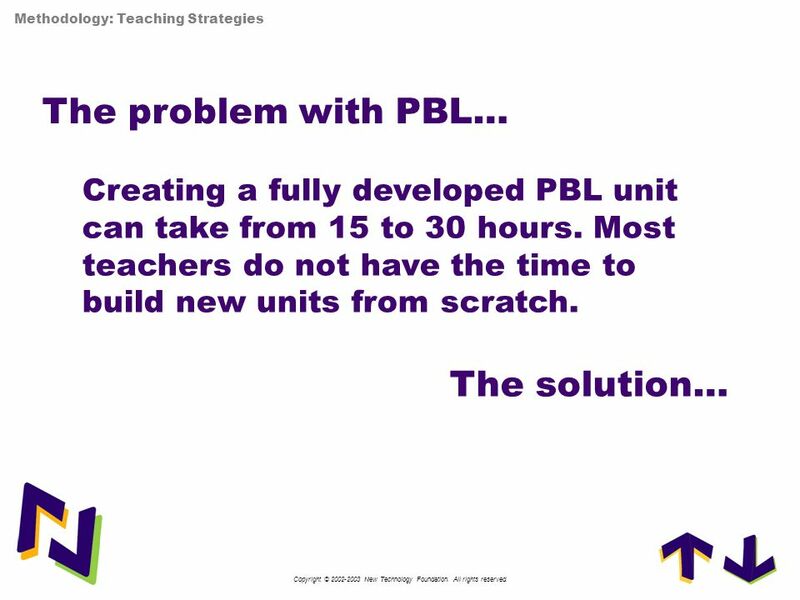 Methodology: Teaching Strategies The problem with PBL… Creating a fully developed PBL unit can take from 15 to 30 hours. Most teachers do not have the time to build new units from scratch. The solution… Copyright © New Technology Foundation. All rights reserved. 26 Copyright © 2002-2003 New Technology Foundation. All rights reserved. Methodology: Teaching Strategies The New Technology Project Library We have assembled a collection of projects created by teachers trained in PBL unit development, reviewed, and tested in the classroom. These projects can be downloaded and modified by any teacher with a connection to the internet. Copyright © New Technology Foundation. All rights reserved. CONTENTS METHODOLOGY Learning Outcomes Teaching Strategies Assessment Assessment Picture symbolizing learning system …what would be our book cover TOOLS Instruction Tools Assessment Tools It’s not about the technology Communication Tools RESULTS Statistics and Research Anecdotal Data Copyright © New Technology Foundation. All rights reserved. 28 Copyright © 2002-2003 New Technology Foundation. All rights reserved. Methodology: Student Assessment ? What do traditional teachers do with a major research paper that has been turned in late? Copyright © New Technology Foundation. All rights reserved. 29 Copyright © 2002-2003 New Technology Foundation. All rights reserved. 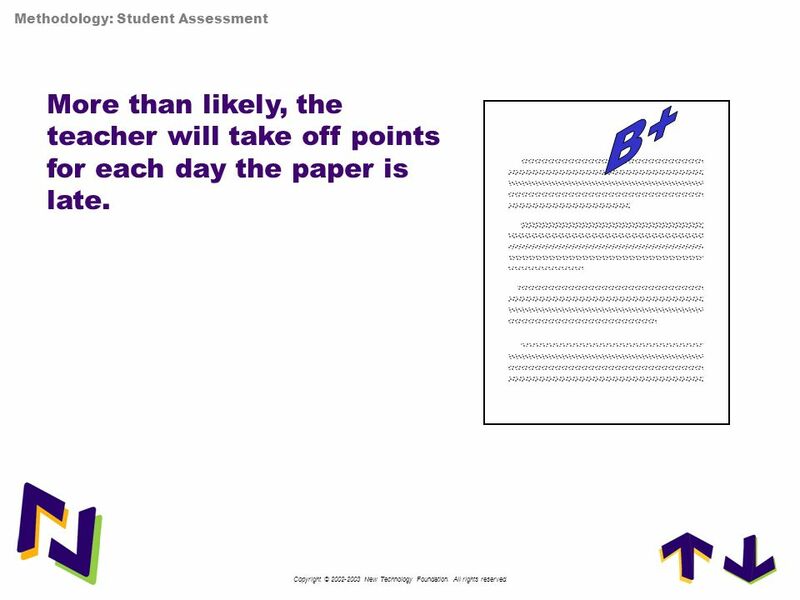 Methodology: Student Assessment More than likely, the teacher will take off points for each day the paper is late. B+ Copyright © New Technology Foundation. All rights reserved. 30 Copyright © 2002-2003 New Technology Foundation. All rights reserved. 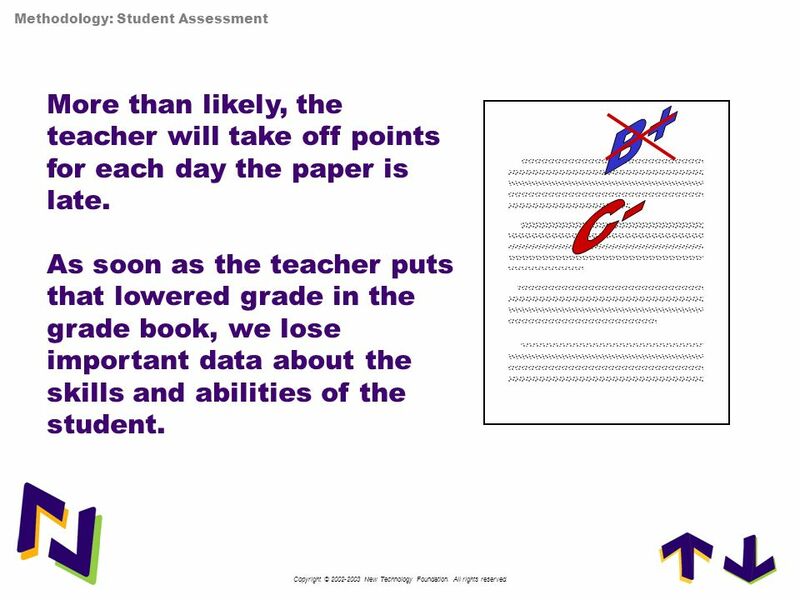 Methodology: Student Assessment More than likely, the teacher will take off points for each day the paper is late As soon as the teacher puts that lowered grade in the grade book, we lose important data about the skills and abilities of the student. B+ C- Copyright © New Technology Foundation. All rights reserved. 31 Copyright © 2002-2003 New Technology Foundation. All rights reserved. 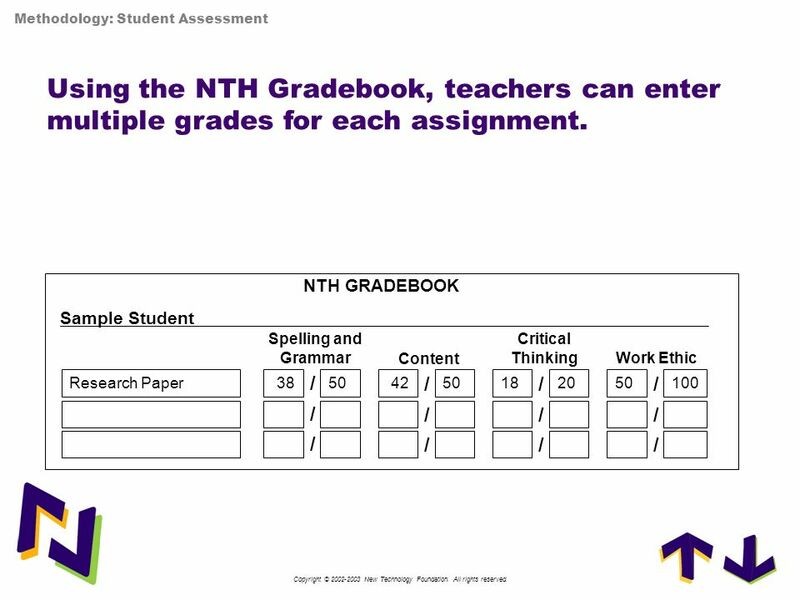 Methodology: Student Assessment Using the NTH Gradebook, teachers can enter multiple grades for each assignment. 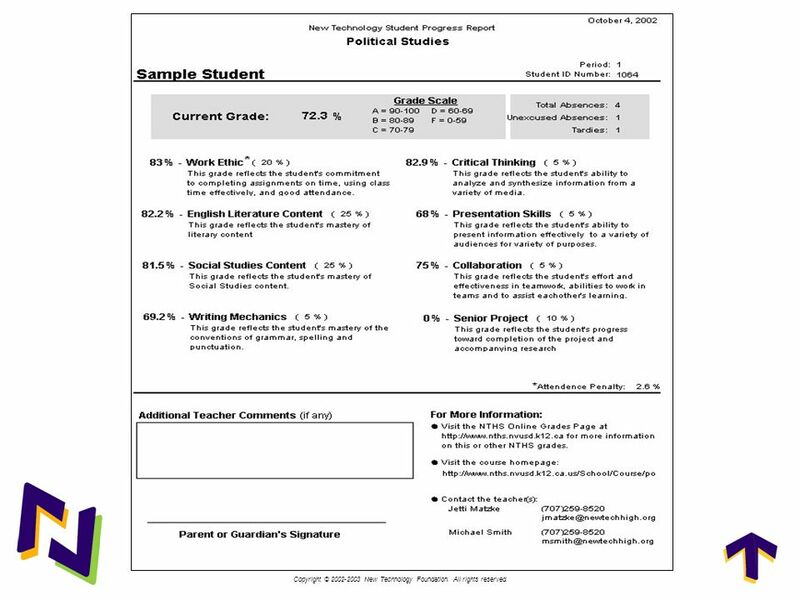 NTH GRADEBOOK Sample Student Spelling and Grammar Critical Thinking Content Work Ethic Research Paper 38 / 50 42 / 50 18 / 20 50 / 100 / / / / / / / / Copyright © New Technology Foundation. All rights reserved. 32 Copyright © 2002-2003 New Technology Foundation. All rights reserved. 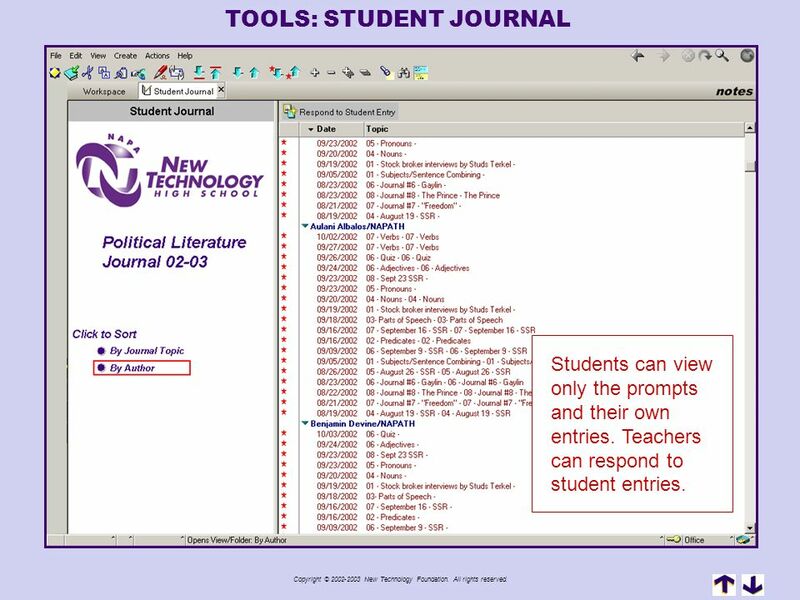 Methodology: Student Assessment Using the NTH Gradebook, teachers can enter multiple grades for each assignment They can accurately record that the paper was late without losing data on how well the student understood the content. NTH GRADEBOOK Sample Student Spelling and Grammar Critical Thinking Content Work Ethic Research Paper 38 / 50 42 / 50 18 / 20 50 / 100 / / / / / / / / Copyright © New Technology Foundation. All rights reserved. 33 Copyright © 2002-2003 New Technology Foundation. All rights reserved. Methodology: Student Assessment While a test is primarily a measure of one thing only – academic content… Copyright © New Technology Foundation. All rights reserved. 34 Copyright © 2002-2003 New Technology Foundation. All rights reserved. Methodology: Student Assessment While a test is primarily a measure of one thing only – academic content… …a project might be evaluated for presentation skills, collaboration skills, critical thinking/problem solving, work ethic/time management and content. Copyright © New Technology Foundation. All rights reserved. Methodology: Student Assessment TRADITIONAL HIGH SCHOOL COURSE PROGRESS REPORT Tests (40%) % Homework (30%) % Papers (30%) % C+ TOTAL % What can you learn about the skills and abilities of this student using a traditional course progress report? ? Copyright © New Technology Foundation. All rights reserved. 36 Copyright © 2002-2003 New Technology Foundation. All rights reserved. Methodology: Student Assessment IN CONTRAST… What can you learn about the skills and abilities of this student using the Learning System’s progress report? More importantly, if you were this student’s parent, how could you help? CLICK TO ENLARGE Copyright © New Technology Foundation. All rights reserved. 37 Copyright © 2002-2003 New Technology Foundation. All rights reserved. 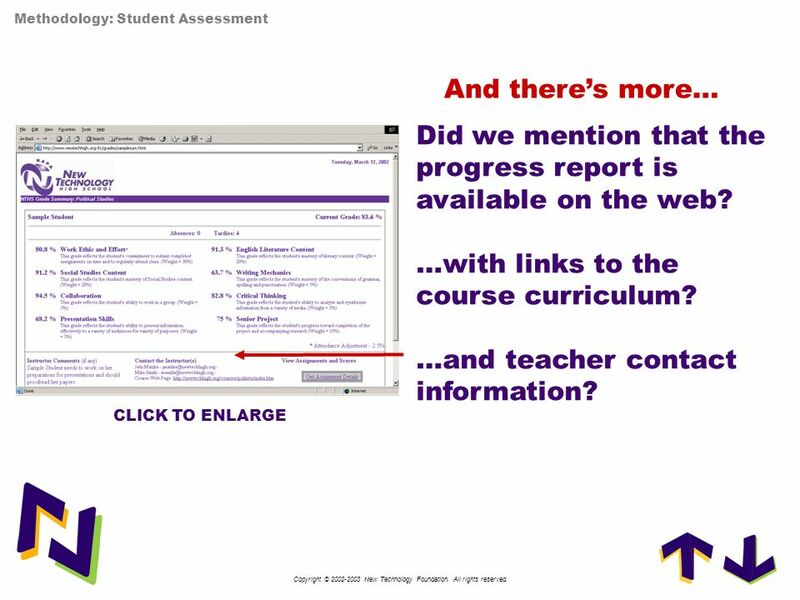 Methodology: Student Assessment And there’s more… Did we mention that the progress report is available on the web? CLICK TO ENLARGE Copyright © New Technology Foundation. All rights reserved. 38 Copyright © 2002-2003 New Technology Foundation. All rights reserved. 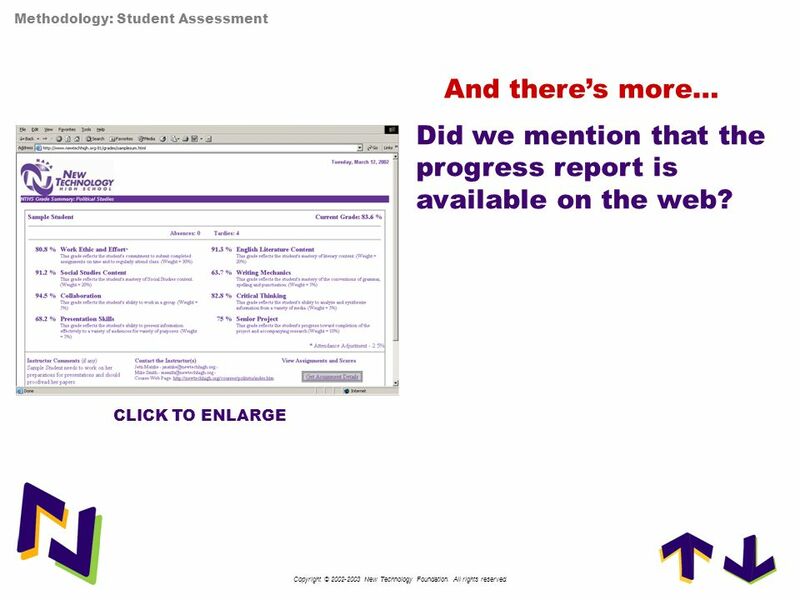 Methodology: Student Assessment And there’s more… Did we mention that the progress report is available on the web? …with links to the course curriculum? CLICK TO ENLARGE Copyright © New Technology Foundation. All rights reserved. 39 Copyright © 2002-2003 New Technology Foundation. All rights reserved. 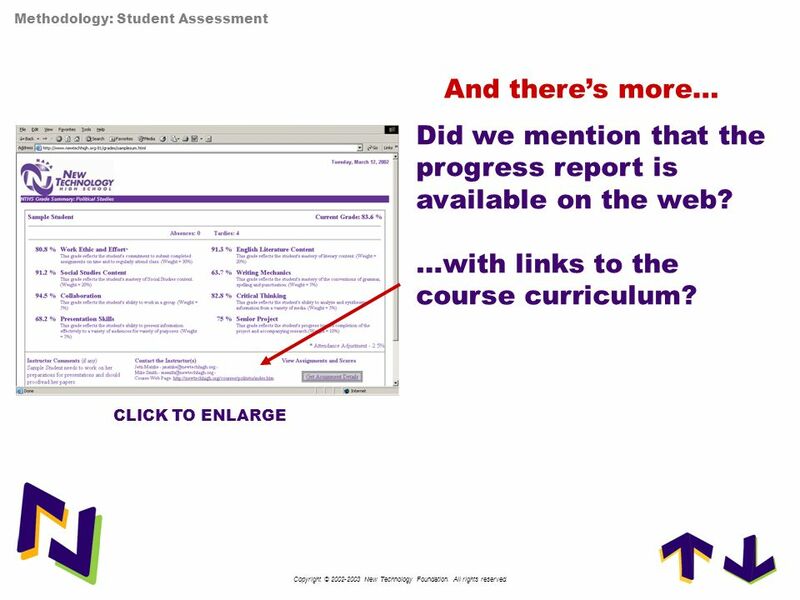 Methodology: Student Assessment And there’s more… Did we mention that the progress report is available on the web? …with links to the course curriculum? …and teacher contact information? CLICK TO ENLARGE Copyright © New Technology Foundation. All rights reserved. CONTENTS METHODOLOGY Learning Outcomes Teaching Strategies Assessment Picture symbolizing learning system …what would be our book cover TOOLS Instruction Tools Instruction Tools Assessment Tools It’s not about the technology Communication Tools RESULTS Statistics and Research Anecdotal Data Copyright © New Technology Foundation. All rights reserved. 41 Copyright © 2002-2003 New Technology Foundation. All rights reserved. Tools That Support The Methodology ? 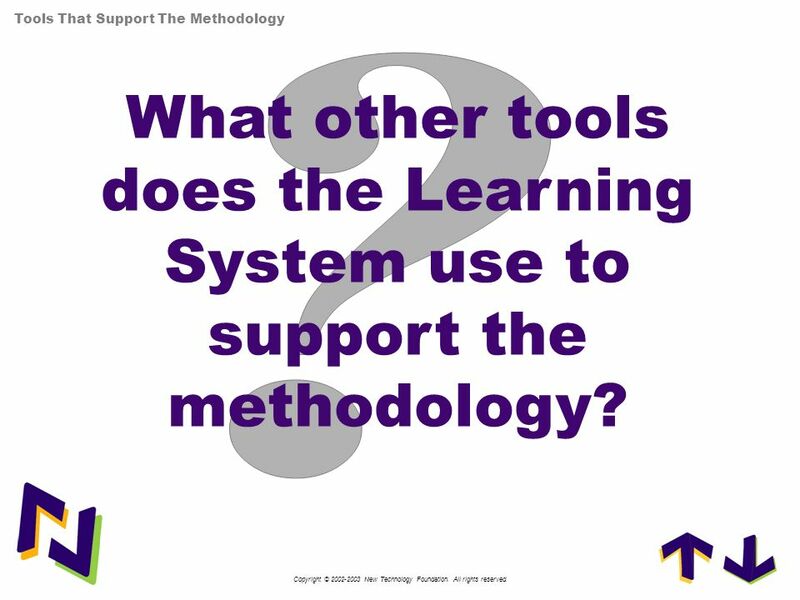 What other tools does the Learning System use to support the methodology? Copyright © New Technology Foundation. All rights reserved. 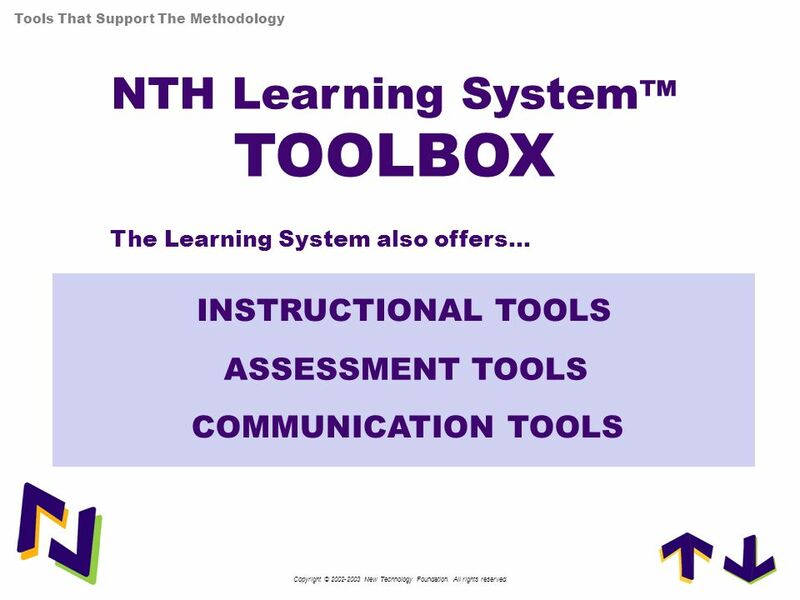 Tools That Support The Methodology NTH Learning System™ TOOLBOX The Learning System also offers… INSTRUCTIONAL TOOLS ASSESSMENT TOOLS COMMUNICATION TOOLS Copyright © New Technology Foundation. All rights reserved. 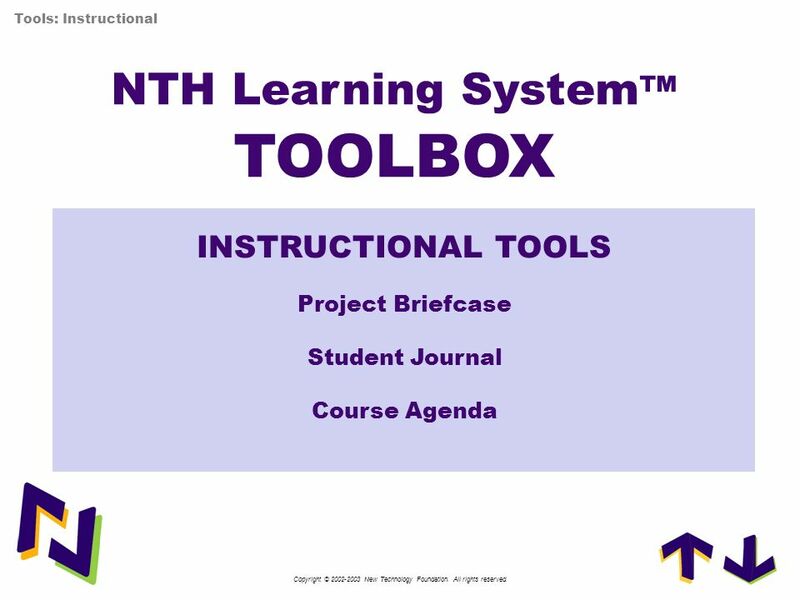 Tools: Instructional NTH Learning System™ TOOLBOX INSTRUCTIONAL TOOLS Project Briefcase Student Journal Course Agenda Copyright © New Technology Foundation. All rights reserved. The Project Briefcase allows teachers to put all project materials in one spot for easy student access and to share with other teachers. Copyright © New Technology Foundation. All rights reserved. All items are immediately and dynamically published to the web for access to the curriculum anywhere, anytime. Copyright © New Technology Foundation. All rights reserved. 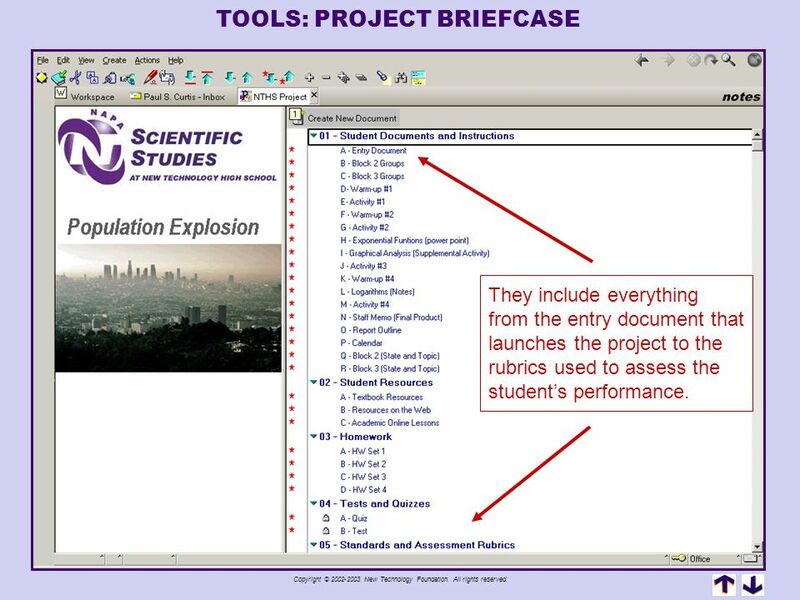 They include everything from the entry document that launches the project to the rubrics used to assess the student’s performance. Copyright © New Technology Foundation. All rights reserved. Teachers can easily lock items from the student view. Copyright © New Technology Foundation. All rights reserved. 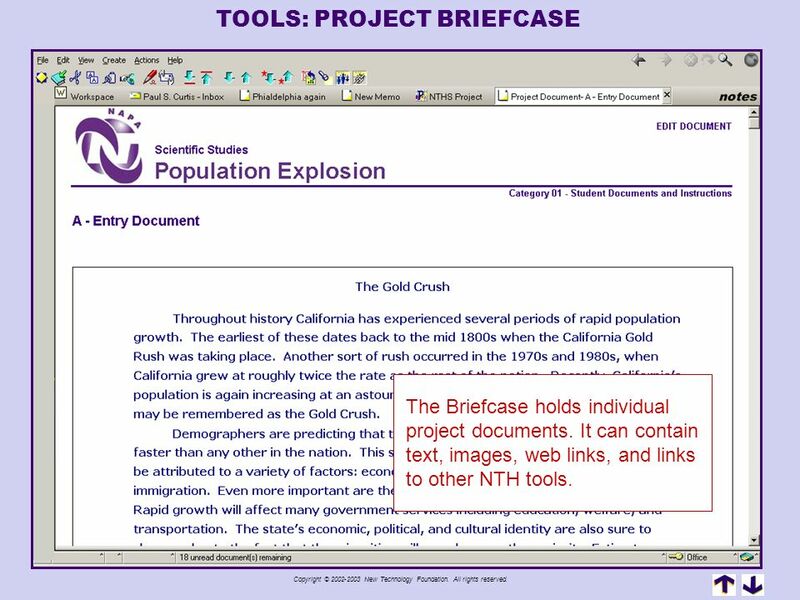 The Briefcase holds individual project documents. 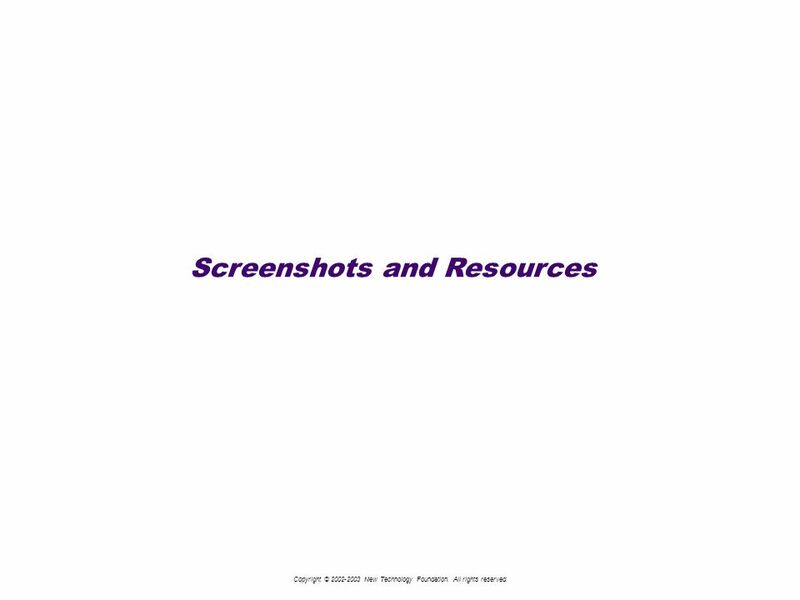 It can contain text, images, web links, and links to other NTH tools. Copyright © New Technology Foundation. All rights reserved. 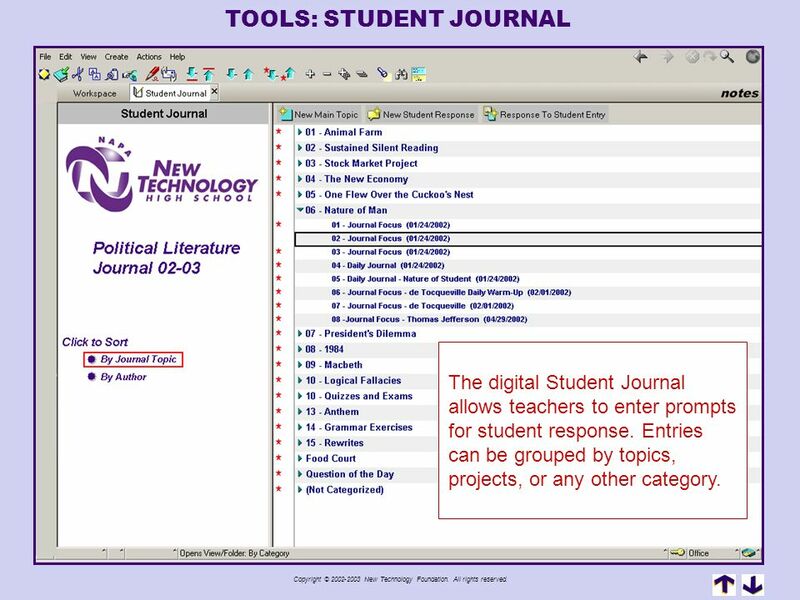 The digital Student Journal allows teachers to enter prompts for student response. Entries can be grouped by topics, projects, or any other category. Copyright © New Technology Foundation. All rights reserved. The journals are used by teachers to monitor student progress on projects, as warm-up activities to start class, and as content and topic reflection journals. Copyright © New Technology Foundation. All rights reserved. Students can view only the prompts and their own entries. Teachers can respond to student entries. Copyright © New Technology Foundation. All rights reserved. 52 Copyright © 2002-2003 New Technology Foundation. All rights reserved. 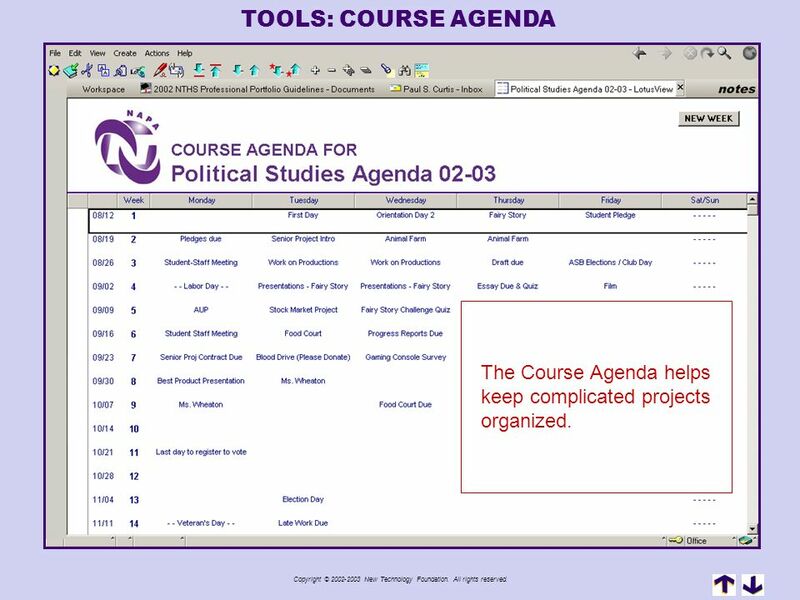 TOOLS: COURSE AGENDA The Course Agenda helps keep complicated projects organized. Copyright © New Technology Foundation. All rights reserved. 53 Copyright © 2002-2003 New Technology Foundation. All rights reserved. 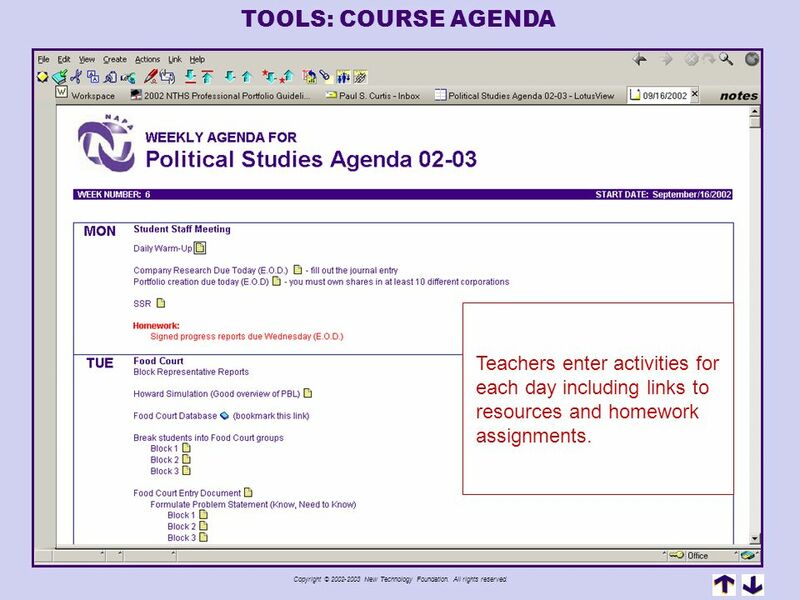 TOOLS: COURSE AGENDA Teachers enter activities for each day including links to resources and homework assignments. Copyright © New Technology Foundation. All rights reserved. 54 Copyright © 2002-2003 New Technology Foundation. All rights reserved. 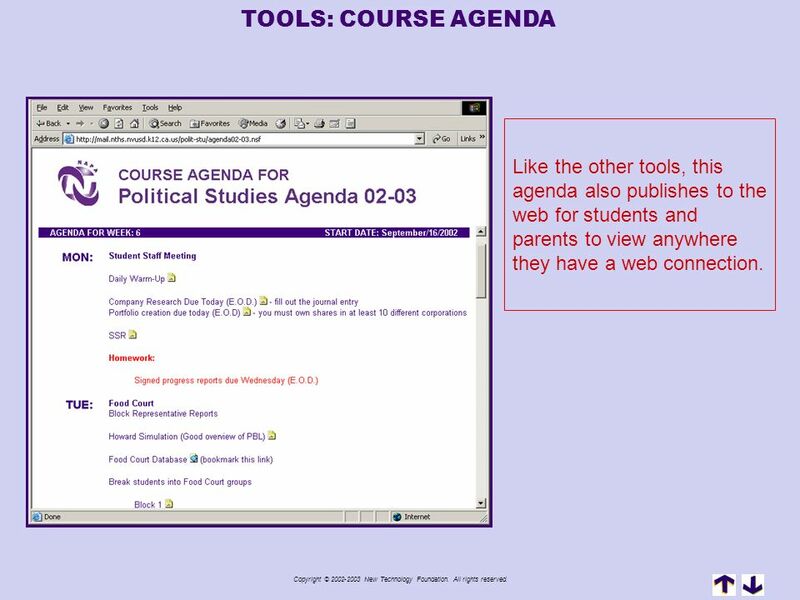 TOOLS: COURSE AGENDA Like the other tools, this agenda also publishes to the web for students and parents to view anywhere they have a web connection. Copyright © New Technology Foundation. All rights reserved. CONTENTS METHODOLOGY Learning Outcomes Teaching Strategies Assessment Picture symbolizing learning system …what would be our book cover TOOLS Instruction Tools Assessment Tools Assessment Tools It’s not about the technology Communication Tools RESULTS Statistics and Research Anecdotal Data Copyright © New Technology Foundation. All rights reserved. 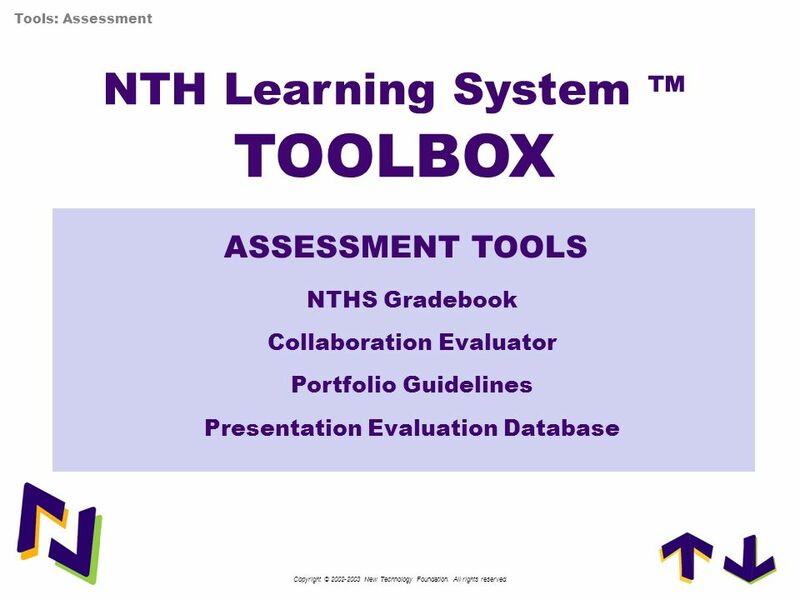 Tools: Assessment NTH Learning System ™ TOOLBOX ASSESSMENT TOOLS NTHS Gradebook Collaboration Evaluator Portfolio Guidelines Presentation Evaluation Database Copyright © New Technology Foundation. All rights reserved. 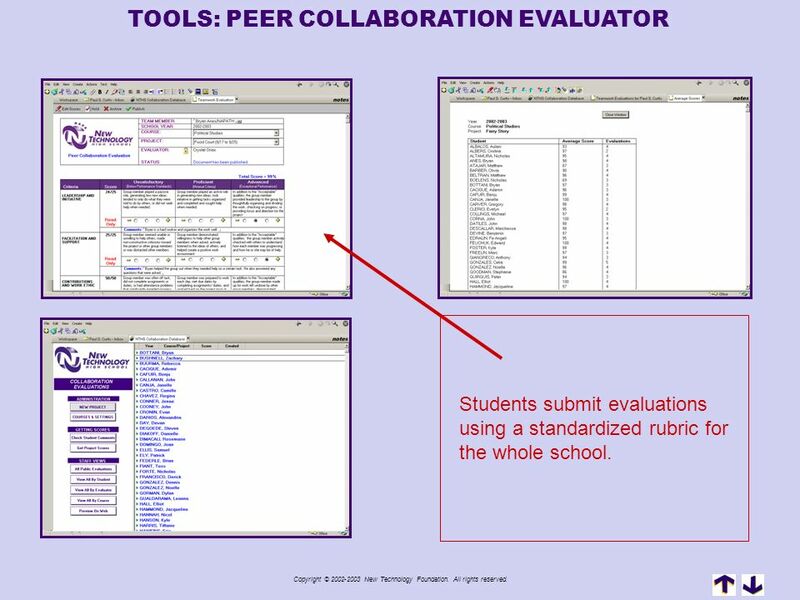 At the end of each project, students evaluate their group members using this collaboration rubric database. Copyright © New Technology Foundation. All rights reserved. Students submit evaluations using a standardized rubric for the whole school. Copyright © New Technology Foundation. All rights reserved. Students can view how their peers rated them (although the evaluations are anonymous). Teachers can view, edit, and delete evaluations as necessary. They can also print a report that averages the evaluations for a given project. Copyright © New Technology Foundation. All rights reserved. The evaluations are accessible on the web. Students have the option to “publish” the evaluations for use as evidence of their collaboration skills. This is the key to allowing students to demonstrate their performance of our learning outcomes. Copyright © New Technology Foundation. All rights reserved. 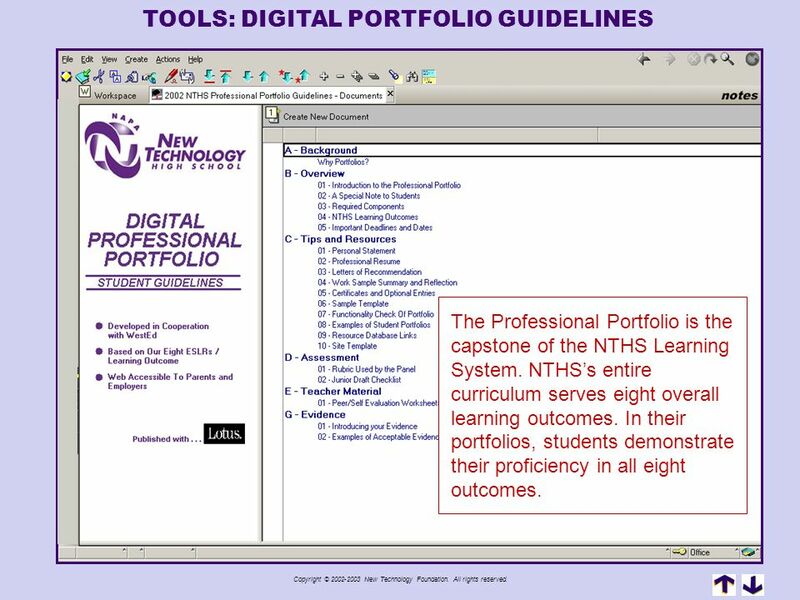 The Professional Portfolio is the capstone of the NTHS Learning System. 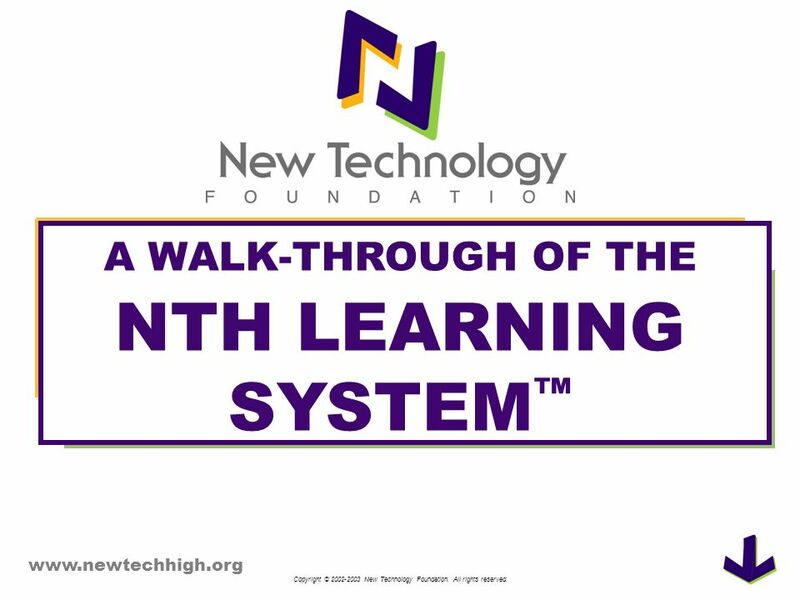 NTHS’s entire curriculum serves eight overall learning outcomes. In their portfolios, students demonstrate their proficiency in all eight outcomes. Copyright © New Technology Foundation. All rights reserved. These guidelines provide structure around what is otherwise a student-managed collection of projects, evaluations, and documents organized into a web site. Copyright © New Technology Foundation. All rights reserved. The resulting portfolios are as diverse as the student body but with similar layouts and organization to aid in evaluation by staff and community members. 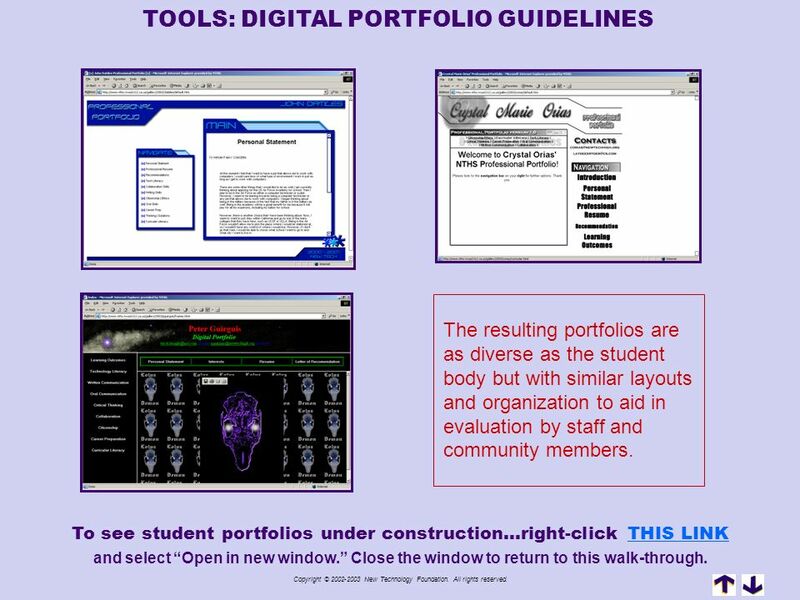 To see student portfolios under construction…right-click THIS LINK and select “Open in new window.” Close the window to return to this walk-through. Copyright © New Technology Foundation. All rights reserved. 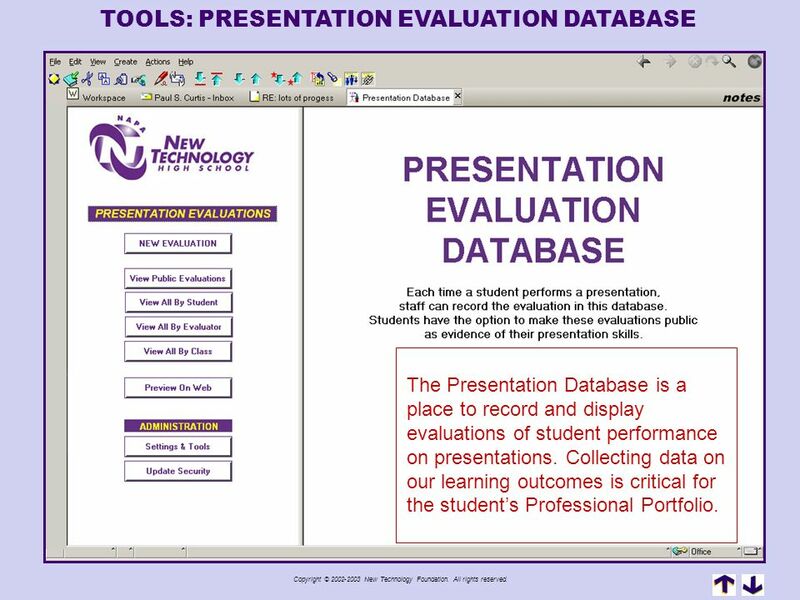 The Presentation Database is a place to record and display evaluations of student performance on presentations. Collecting data on our learning outcomes is critical for the student’s Professional Portfolio. Copyright © New Technology Foundation. All rights reserved. The evaluations are accessible from the web after the student has marked the evaluation “public”. Copyright © New Technology Foundation. All rights reserved. CONTENTS METHODOLOGY Learning Outcomes Teaching Strategies Assessment Picture symbolizing learning system …what would be our book cover TOOLS Instruction Tools Assessment Tools It’s not about the technology Communication Tools Communication Tools RESULTS Statistics and Research Anecdotal Data Copyright © New Technology Foundation. All rights reserved. 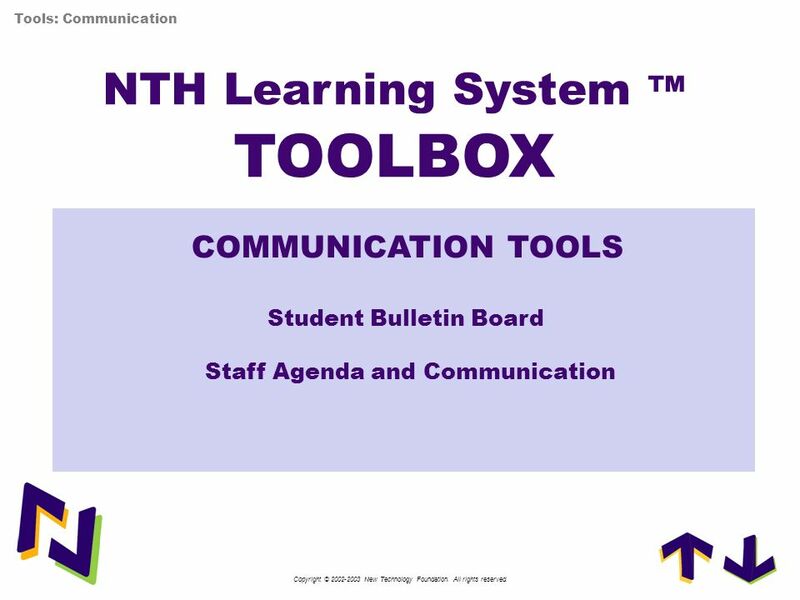 Tools: Communication NTH Learning System ™ TOOLBOX COMMUNICATION TOOLS Student Bulletin Board Staff Agenda and Communication Copyright © New Technology Foundation. All rights reserved. 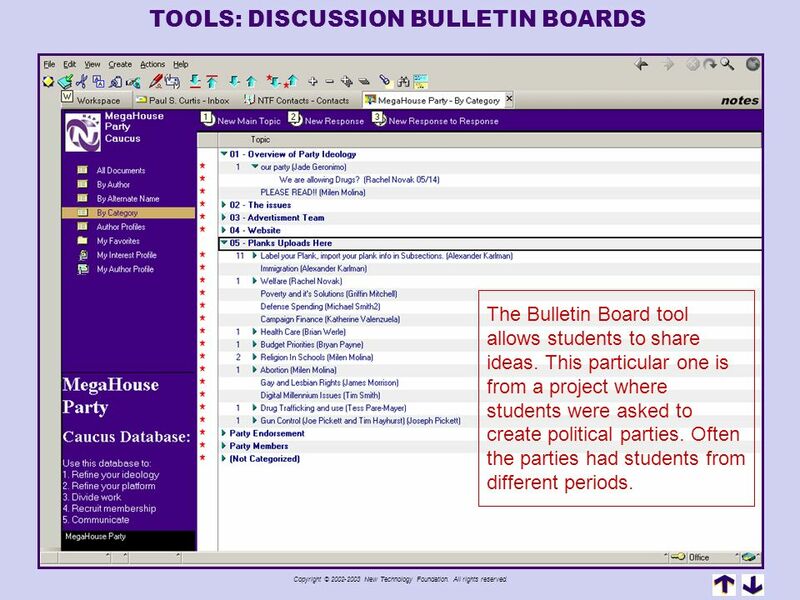 The Bulletin Board tool allows students to share ideas. This particular one is from a project where students were asked to create political parties. Often the parties had students from different periods. Copyright © New Technology Foundation. All rights reserved. 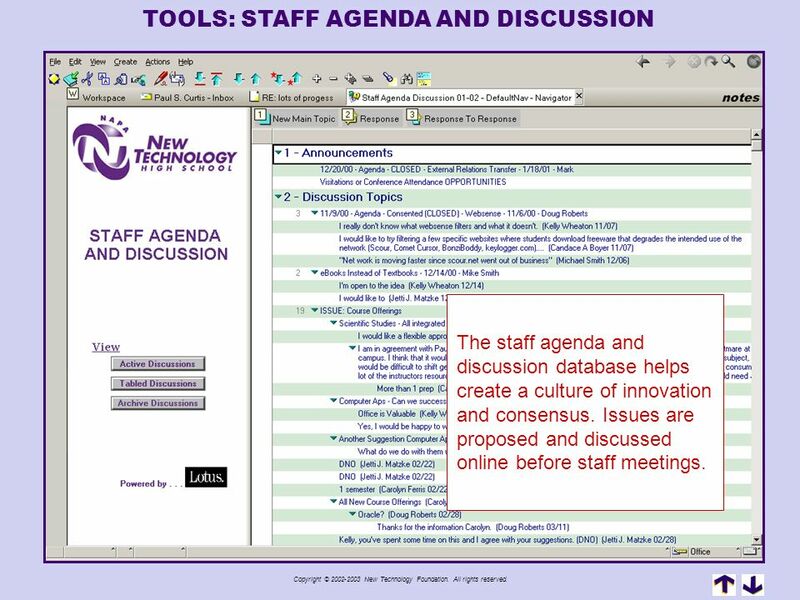 The staff agenda and discussion database helps create a culture of innovation and consensus. Issues are proposed and discussed online before staff meetings. Copyright © New Technology Foundation. All rights reserved. 70 Copyright © 2002-2003 New Technology Foundation. All rights reserved. Tools: Summary The technologies and tools that have evolved over the past seven years reflect the unique needs of students and teachers who are teaching in a student- centered, project- and problem- based curriculum. Copyright © New Technology Foundation. All rights reserved. CONTENTS METHODOLOGY Learning Outcomes Teaching Strategies Assessment Picture symbolizing learning system …what would be our book cover TOOLS Instruction Tools Assessment Tools It’s not about the technology Communication Tools RESULTS Statistics and Research Statistics and Research Anecdotal Data Copyright © New Technology Foundation. All rights reserved. 72 Copyright © 2002-2003 New Technology Foundation. All rights reserved. Results: Statistics and Research ? 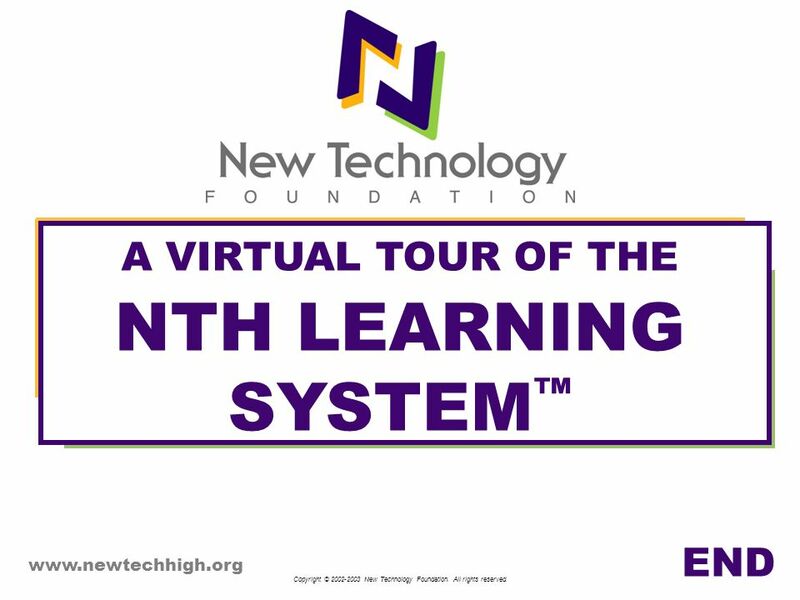 How have students using the NTH Learning System™ performed compared to other schools? Copyright © New Technology Foundation. All rights reserved. 73 Copyright © 2002-2003 New Technology Foundation. All rights reserved. Results: Statistics and Research EXTERNAL EVALUATIONS Western Association of Schools and Colleges (WASC) Gave NTHS-Napa a six-year with no follow-up accreditation (their highest ranking – top 5%) California’s Academic Performance Index Rated 10 out of 10 in student performance, which takes economic and social issues into account. New American High School Designated by the federal government as a model for school reform. Bill & Melinda Gates Foundation Selected to replicate the school in 10 Northern California locations, creating a network of similar schools. Copyright © New Technology Foundation. All rights reserved. 74 Copyright © 2002-2003 New Technology Foundation. All rights reserved. Results: Statistics and Research STUDENT PERFORMANCE Post-Secondary Education 96% of NTHS graduates from enrolled in some form of continuing education (compared to 38% in rest of district) NTHS graduates have been accepted at a diverse set of schools including UC Berkeley, Grinnell, Cal Poly San Luis Obispo, Vassar, UC Santa Cruz, CSU San Diego, CSU San Jose, CSU Sonoma, Brigham Young University, Massachusetts Institute of Technology, Mills College, Boston University, and Franklin College-Switzerland % of NTHS graduates continue their education at Napa Valley College Several students each year attend focused vocational programs such as the Expression Center for New Media or Heald College. Copyright © New Technology Foundation. All rights reserved. CONTENTS METHODOLOGY Learning Outcomes Teaching Strategies Assessment Picture symbolizing learning system …what would be our book cover TOOLS Instruction Tools Assessment Tools It’s not about the technology Communication Tools RESULTS Statistics and Research Anecdotal Data Anecdotal Data Copyright © New Technology Foundation. All rights reserved. 76 ? What is the impact of the Learning System on student success? Results: Anecdotal Data ? What is the impact of the Learning System on student success? Copyright © New Technology Foundation. All rights reserved. 77 Copyright © 2002-2003 New Technology Foundation. All rights reserved. Results: Anecdotal Data STUDENT SUCCESSES An NTHS graduate is running the Information Technology (IT) division of a local Napa business as a result of a successful internship experience. His college education is being paid for by his employer. An NTHS graduate interned in data processing division with a large Napa employer. She was promoted to manager of data processing after graduation and has since leveraged this position into a partnership with a start-up Web design company. An NTHS graduate was offered a $40,000 annual salary, plus stock options, immediately after graduation for a position with a local tech company. An NTHS graduate who came from a high risk environment is now IT Manager for a local employer. Copyright © New Technology Foundation. All rights reserved. 78 Copyright © 2002-2003 New Technology Foundation. All rights reserved. We’ve come a long way… Building an education model that puts students at the center Creating curriculum and a set of tools that support this model Developing a plan to share what we have Copyright © New Technology Foundation. All rights reserved. 79 Copyright © 2002-2003 New Technology Foundation. All rights reserved. 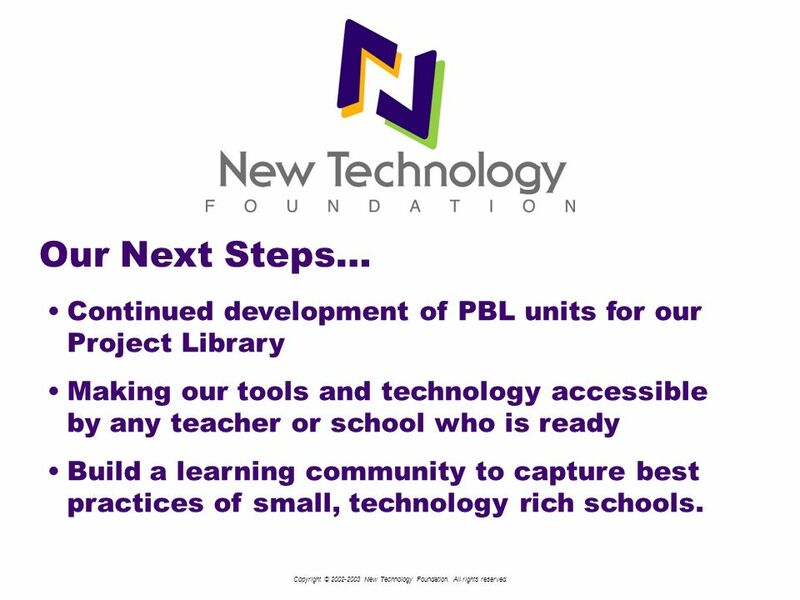 Our Next Steps… Continued development of PBL units for our Project Library Making our tools and technology accessible by any teacher or school who is ready Build a learning community to capture best practices of small, technology rich schools. Copyright © New Technology Foundation. All rights reserved. END Copyright © New Technology Foundation. All rights reserved. 82 Copyright © 2002-2003 New Technology Foundation. All rights reserved. Download ppt "A WALK-THROUGH OF THE NTH LEARNING SYSTEM™"
UCET Annual Conference 2011 Shifting Sands and Stable Foundations: Insecurity and Instability in Teacher Education. This We Believe: Keys to Educating Young Adolescents The position paper of the Association for Middle Level Education. 1 Getting to the Core of the Common Core State Standards What they are! & How they came to be! Implications for Policy and Practice Advanced Literacy Panel. S MALL S CHOOLS MAKING A B IG D IFFERENCE CREATING A NETWORK OF SMALL, HIGH TECH, HIGH IMPACT SCHOOLS. Driving Questions: Strategies for Uses of ARRA Funds Ongoing Professional Development. Rationale for CI 2300 Teaching and Learning in the Digital Age. INACOL National Standards for Quality Online Teaching, Version 2. American Diploma Project Network A coalition of states committed to aligning high school standards, assessments, graduation requirements and accountability. Accrediting Commission for Community and Junior Colleges of the Western Association of Schools and Colleges. “The great end of education is to discipline rather than furnish the mind; to train it to the use of its own powers, rather than fill it with the accumulation.